If you've ever dreamed about designing your own needlepoint, but were afraid your skills were not up to the challenge, wonder no more. Here are three smart tips to help you move from beginner to budding designer, capable of creating your own needlepoint pieces that are as good as those of any professional designer. Part of the great pleasure of designing your own needlepoint is searching for inspiration. With these three resources, you can find lots of inspiration, simply by looking at everything around you and trying to imagine how you would stitch it in needlepoint. You'll be encouraged to play with new ideas—be imaginative and creative. Once you start looking around, you’ll be astonished at the sheer number of ideas that will come to mind and be quickly filled with ways of converting them to needlepoint. Shapes and patterns in familiar scenes of nature. Possibilities in everyday household items, clothing, wall art, rugs and more. Look for design inspiration in photos and the world around you and imagine how they would be stitched in needlepoint. Search for free traditional as well as vintage needlepoint pattern resources. Transfer your new ideas to canvas using paints and colorful markers. These three smart tools will help you effectively design your first needlepoint project and all those that follow. You can use them to make all sorts of needlepoint items; but, you’ll need to be patient to be successful, as creating your own unique needlepoint designs should not be rushed if you want the results of your hard work to be well worth the effort and a source of immense satisfaction when all stitching is done. These resources are great tools for practice and experimentation. Don't throw away any of your beginning designs as they can still be used to stitch some mighty creative needlepoint pieces. Are you ready? Remember, you can create your own needlepoint designs, even if you’re a beginner. Use these smart tips to get started. You get all the inspiration you can use from this free antique pattern library. It contains thousands of needlecraft patterns and free printables to experiment with when you are just beginning to discover how easy it is to create your own needlepoint projects. Most patterns can be used without modification to allow color, shapes and stitches to form unique needlepoint designs. Other charts and drawings from these resources can stimulate your imagination to such a degree that you will only need to use certain motifs and parts of the original patterns to make entirely new needlework creations. Each full-color pattern will start your creative juices flowing with even more imaginative ideas that can be turned into original needlepoint projects. You will soon learn how to look beyond the basic patterns to what you can creatively make with them, from changing colors and direction of stitches to mixing and matching different pattern pieces to even altering the size and dimension of each design motif. Even if you don’t feel confident about your design skills, you need not be intimidated by the sheer volume of patterns on this site. Before downloading anything, make a quick tour of the patterns and either bookmark or open in a new window on your computer any that jump out immediately and inspire you. After you’ve looked at everything on the site (this make take several hours), go back over the ones you’ve selected and narrow the list down to those that really grab your attention. Download and save your selections to use in creating your own needlepoint designs. You can easily adapt ideas to make needlepoint designs by painting them yourself on blank canvas. This step-by-step tutorial shows you everything you need to create your own hand-painted canvas--from choosing the right paints to solving most common problems that can occur. Here are a few examples of things you will learn. When painting needlepoint designs on canvas, it is sometimes worthwhile to think about what the needlework will be when it has been stitched and finished, and then choose design shapes and paints that will complement the item. It’s always a good idea to carefully look over the canvas after painting to make sure the coverage is as you planned. If necessary, go over the areas again with paint until you get the desired finish. Make sure to let the paint dry thoroughly before choosing threads. Wet paint will make the canvas either lighter or darker than when it is dry. This could cause problems when trying to make exact color matches. You are encouraged to experiment with scrap pieces of needlepoint canvas and start with simple projects like tree ornaments or easy shapes that cover large spaces of canvas. Even one shape can be drawn on the canvas several times, with each one painted in a different color to work in your favorite needlepoint stitches. When you are more confident of your work, you can attempt more challenging projects like painted needlepoint portraits or other intricate shape combinations. Anyone who has ever stitched more than one needlepoint project is always looking for ways to keep each new one from being dull and boring and transforming it into an original work of art. Using photos and online images are two of the easiest ways to create needlepoint designs with flair and lots of originality. Creating needlepoint from photos is different from the previous two methods. Instead of tracing designs or painting patterns on canvas, it requires special needlework design software to turn photos and images into needlepoint charts. It is easy to learn how to make attractive needlepoint patterns in this way. Here are a few tips to help you select the right photos for the best designs. Plain photos work best. You’ll want to choose images that are plain and simple without being so busy that the details get lost when the chart is rendered or the final pattern will end up looking too fussy. Get Quality Needlework Design Software. After importing the photo into the design software, make sure to maneuver it into the exact position you want--especially if you are using two or more photos to make a collage or larger needlepoint design. Clean up before rendering. Once you are happy with image placement, make any color switches and additional design changes before cleaning up the edges and background areas. After everything meets with your satisfaction, export or render the design to an image file you can save on your computer. 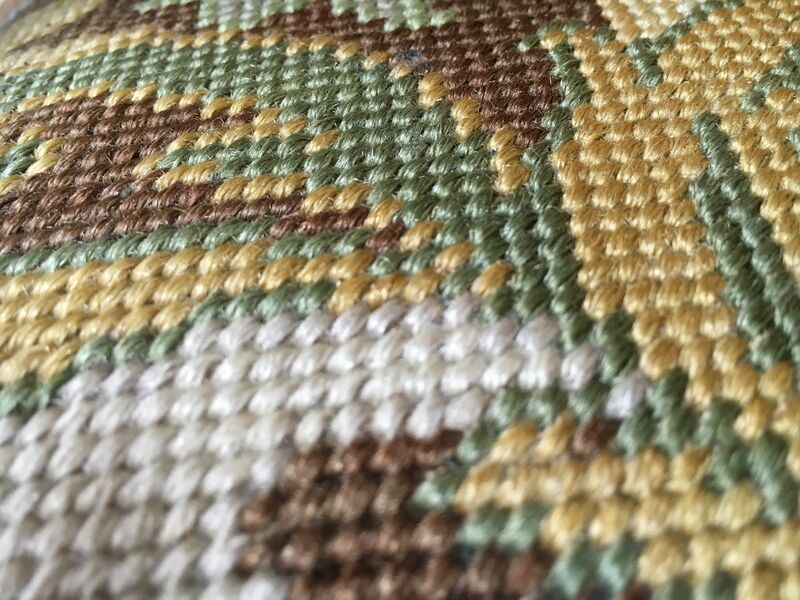 If you must keep a lot of detail, be careful not to overuse needlepoint stitches or specialty threads and fibers when working on relatively small items or you will spoil the finished appearance.